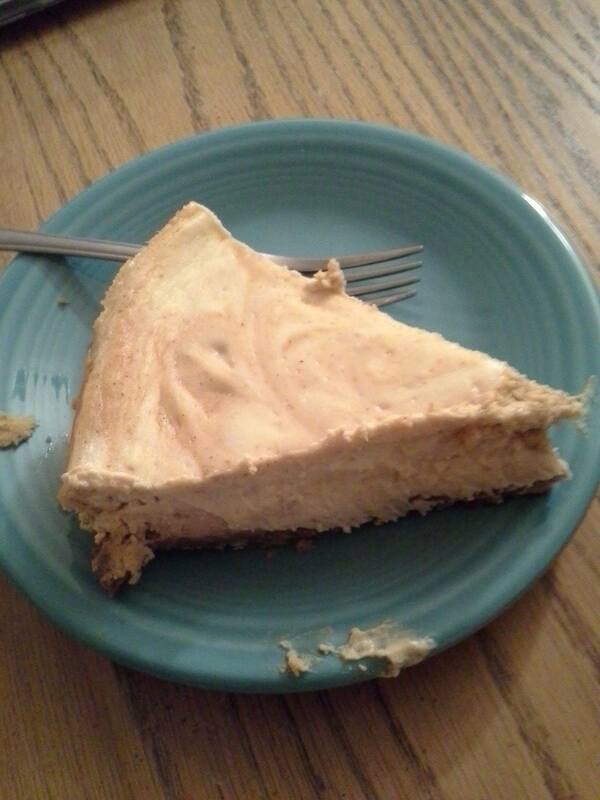 I think this pumpkin cheese cake was the first thing Alex and I made with our Kitchen Aid. It was delicious and we’ve made it at least once or twice more since. I’m definitely keeping this recipe as a staple. We found it of course at AllRecipes.com. You can follow the link or find it below. PS: it’s super easy!! Heat oven to 350 degrees F. Combine cookie crumbs, pecans and butter. Press onto bottom of 9 inch springform pan. Beat cream cheese, 1/2 cup of the sugar and vanilla with electric mixer until well blended. Add eggs, one at a time, mixing on low speed after each addition just until blended. Remove 1 cup plain batter; place in small bowl. Stir remaining 1/4 cup sugar, pumpkin and spices into remaining batter. Spoon pumpkin batter into crust; top with spoonfuls of reserved plain batter. Cut through batters with knife several times for marble effect. Bake 45 minutes or until centre is almost set. Cool completely. Refrigerate 4 hours or overnight. Cut into 12 slices. Store leftover cheesecake in refrigerator. « Pumpkin Chocolate Chip Cookies – Shelle H.